Recombinant fragment corresponding to Human HEC1/HEC aa 56-642. This product was changed from ascites to tissue culture supernatant on 17th September 2018. Please note that the dilutions may need to be adjusted accordingly. If you have any questions, please do not hesitate to contact our scientific support team. Our Abpromise guarantee covers the use of ab3613 in the following tested applications. WB 1/1000. Detects a band of approximately 80 kDa (predicted molecular weight: 74 kDa). ab3613 at 1/1000 dilution staining HeLa cells by ICC/IF. The cells were formaldehyde fixed and blocked with 5% BSA prior to incubation with the antibody for 2 hours. An Alexa-Fluor ® 488 conjugated goat anti-mouse antibody was used as the secondary. Blocking conditions: 5% non-fat milk in TBST, RT, 60min. HEC1/HEC was immunoprecipitated using 0.5mg Hela whole cell extract, 10µg of Mouse monoclonal to HEC1/HEC and 50µl of protein G magnetic beads (+). No antibody was added to the control (-). Proteins were eluted by addition of 40µl SDS loading buffer and incubated for 10min at 70oC; 10µl of each sample was separated on a SDS PAGE gel, transferred to a nitrocellulose membrane, blocked with 5% BSA and probed with ab3613. Anti-HEC1/HEC antibody (ab3613) labels the kinetochores of mitotic cells in LLCPK1 (Sus scrofa kidney epithelial cell line) cell lines. 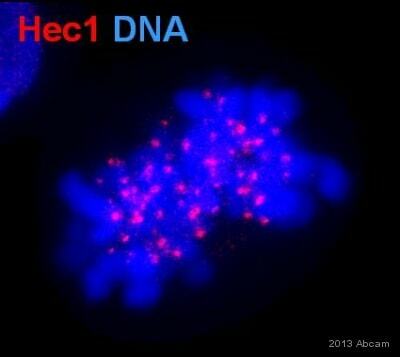 Merge shows an overlay of DNA (stained with DAPI, red) and HEC1/HEC (green). This image was kindly supplied as part of the review submitted by Marko Kallio. Overlay histogram showing HeLa cells stained with ab3613 (red line). The cells were fixed with 4% paraformaldehyde (10 min) and then permeabilized with 0.1% PBS-Tween for 20 min. The cells were then incubated in 1x PBS / 10% normal goat serum / 0.3M glycine to block non-specific protein-protein interactions followed by the antibody (ab3613, 1µg/1x106 cells) for 30 min at 22°C. The secondary antibody used was DyLight® 488 goat anti-mouse IgG (H+L) (ab96879) at 1/500 dilution for 30 min at 22°C. Isotype control antibody (black line) was mouse IgG2b [PLPV219] (ab91366, 2µg/1x106 cells) used under the same conditions. Acquisition of >5,000 events was performed. This antibody gave a positive signal in HeLa cells fixed with 80% methanol (5 min) /permeabilized in 0.1% PBS-Tween used under the same conditions. 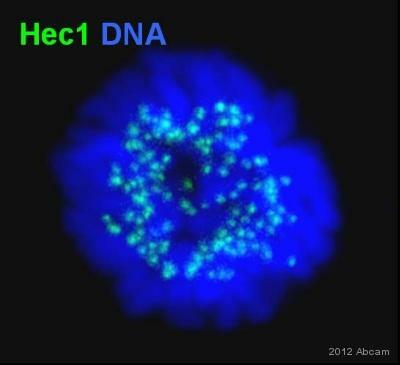 HeLA cells were stained with anti-HEC1/HEC (ab2613; in green) and DAPI (blue) in panel 1, and with anti-HEC1/HEC (green) and SH-CREST (red) to stain the centromeres in panel 2. Fix the cells 30 minutes on ice in 4% formaldehyde in PEM. Quench autofluorescence 2 x 5 min. with 1 mg/ml Na borohydride or 100 mM ammonium chloride in PEM. Permeablize 30 min. with 0.5% TX-100 in PEM. Block 30 minutes in 5% milk in TBST. Primary antibody incubated at 1/1000 overnight at 4oC diluted in 5% milk in TBST. Secondary antibody 1 hour at RT diluted in 5% milk in TBST. Post-fix 20 min. on ice in 4% formaldehyde in PEM. Quench autofluorescence 2 x 5 min. with ammonium chloride in PEM. 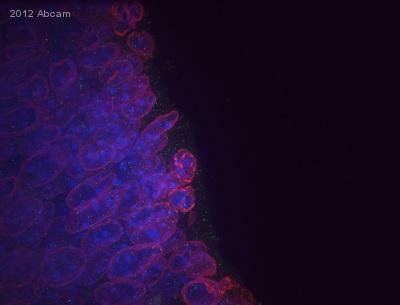 Counterstain with DAPI in TBST. Mount with ProLong Gold antifade reagent from Invitrogen. Notes: Ample washing between each step. TBST = Tris buffered saline + 0.1% Tween. PEM = 80 mM K-PIPES, pH 6.8, 5 mM EGTA, 2 mM MgCl2. Publishing research using ab3613? Please let us know so that we can cite the reference in this datasheet. Sure. The ratio I used for WB was 1:1000, and the antibody and membrane were incubated in 5% milk for overnight. Following the incubation, the membrane was washed by 0.05% TBS-T buffer for three times (every 10 minutes), and then incubated with secondary antibody for 1 hour, and the secondary antibody was washed out for three times also after the incubation. Attached picture is the film was exposed for 5 seconds, the area with black is the membrane incubated with Hec1 antibody. Let me know if more information is needed, thanks. 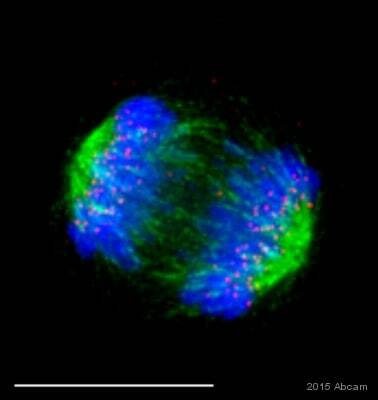 In general, issues like this arise from the secondary antibody. Often the antibody is too concentrated or is reacting with something in you buffers (usually milk or BSA) Have you had the opportunity to reduce the concentration of the secondary antibody when using this product or have you tried changing your blocking/incubation buffer? You may sometimes see these types of problem before film exposure by looking at the membrane in a darkroom after ECL. If the membrane is glowing then you should allow it to 'cool down' for up to 1 hour before exposure to film. I was also wondering if you could let me know what type of ECL reagent you are using? A high intensity ECL reagent like the Pierce Pico or Dura, GE Prime or Abcam Optiblot Ultradetect may be too sensitive for use with this product. If using a high sensitivity product we suggest switching to a lower sensitivity ECL reagent. Thank you for enquiry and your interest. I can confirm that this antibody (ab3613) recognizes Mouse, Human, Pig, African Green Monkey - it has not been tested in yeast and currently we do not have antibodies which detect HEC1 in Saccharomyces. My note below was met with a request for more information regarding fixation conditions, etc. before a replacement was offered. We are loyal Abcam customers and want this taken care of as soon as possible. 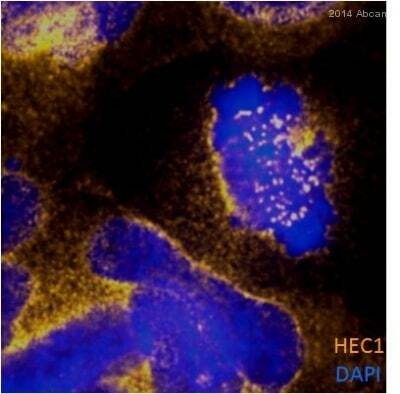 Please find details below: We tried IF again using this lot of HEC1 antibody, with similar results as before. We don't see kinetochore staining as we saw with a previous lot. The IF protocol failed using both methanol and formaldehyde fixation. The other channels and dapi looked fine. Furthermore, I didn't see specific Hec1 bands for my last western blot with your antibody either. Please send a replacement (9G3 HEC1 antibody) ASAP. I appreciate your cooperation and understand your concerns. It is regrettable that this product has not matched the standards of those previously. Under our Abpromise, we guarantee that our product will work in a the manner stated on the datasheet, e.g. Western Blot on porcine tissue. If the product has failed to do so, we offer scientific support, replace or refund of the product. Our Abpromise covers the product for 6 months. The details requested are nessesary in order for us to determine whether this product is covered by our Abpromise. If you could provide some information, such as species type or protocol conditions this would be very helpful. We appreciate your time taken to supply us this information. This information will also be helpful to our quality monitoring. I will be pleased to provide a free of charge replacmenet or credit note if the antibody is not working as it should be and has been purchased within the last 6 months. In order to process this I will need the Abcam order confirmation number or the PO number used to purchase the product. I have called and left a message with you in regards to this issue. Feel free to disregard that call should this be a better forum for communicating. I am sorry that the latest lot of this product is not performing well for you. Before I may issue a replacement however I was hoping that you could please send me the protocol that you have used, any troubleshooting steps that you might have performed and any images should you have them. Please be as specific as possible as this data will help us pinpoint issues that the antibody might have and test them as necessary. Customer kindly asked how the antibody should be diluted at 1/1000 dilution. Thank you very much for your phone call. The dilution given on the datasheet is for guideline purpose only. The dilutions have to be optimized by the end user based on cells or tissue sections they use. We recommend using a range e.g. 1/500, 1/1000 and 1/2000 dilution; this range will helps to get best optimized results at particular dilutions. 1/1000 dilution =1 ul of antibody diluted in 999 ul of buffer (1-5%BSA + PBS). or 10 ul of antibody solution in 9990 ul of buffer will give the same 1/1000 dilution with total volume of 10ml. We recommend aliquoting 10 ul per vial and storing the antibody neat at -20C or -80C (as recommended on datasheet). Antibodies can also be diluted in PBS with 1-3% BSAin casethere is need for diluted antibody to be stored. I hope this info will be helpful. SHould you have any other inquiry please do not hesitate to contact us.